In the Bible, the head of John the Baptist- by far the most important and popular Jewish preacher of his time- was given to appease Salome, the step-daughter of King Herod. Scholars are unsure whether this is the same Salome who was a follower of Jesus. But what is known as the Johannite tradition has been a major part of the esoteric counterculture within the West. It was of such a concern to the Vatican that as late as the mid-19th Century the Pope saw fit to preach against it. Funny, no one has ever seemed to accuse the Pope of being a conspiracy theorist when he claimed that the Freemasons were the inheritors of the Templar mantle and were seeking to finish the work the Knights began, all in the name of the Baptist. This tradition- still very much with us - doesn't see the Baptist as the "forerunner," but as the esoteric master, the True Christ. Bear all of this in mind when you remember that the founding moguls of Hollywood - Mayer, Zanuck and Warner- were first and foremost Scottish Rite Freemasons. In Kubrick and Clarke's Masonic hymn, 2001: A Space Odyssey, we see this masterful image, as Bowman works to get back onto the Discovery One. 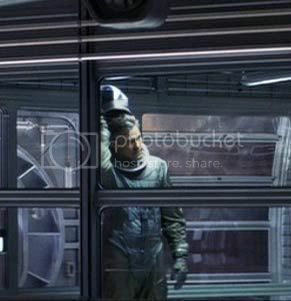 Bowman, of course, was locked out of the ship by HAL 9000, who obviously saw Bowman as his "forerunner." 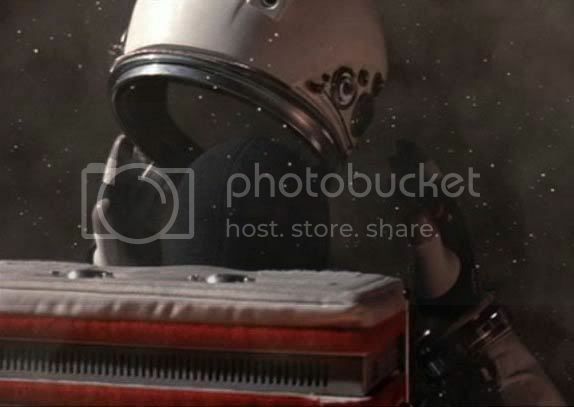 Note how the seal of his spacesuit creates the image of a head on a platter. 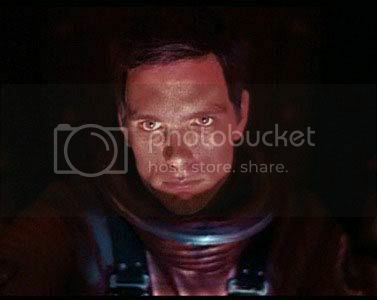 The removal of the space helmet in pivotal scenes would be a key motif in the films that followed in 2001's wake. Here we see "Woody" sacrifice himself for the good of the mission in the Disney-NASA co-production Mission to Mars. In this scene, the Baptist symbolism is even more explicit. 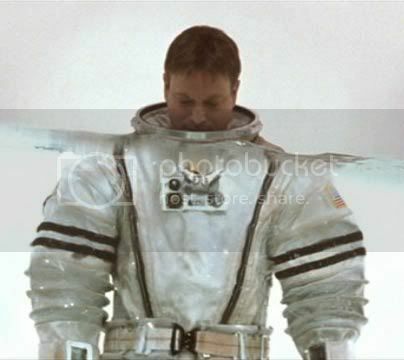 Gary Sinise's character is himself baptized as he becomes one with the Martian technology. Did I mention that NASA was involved in this production, something they had never done before? 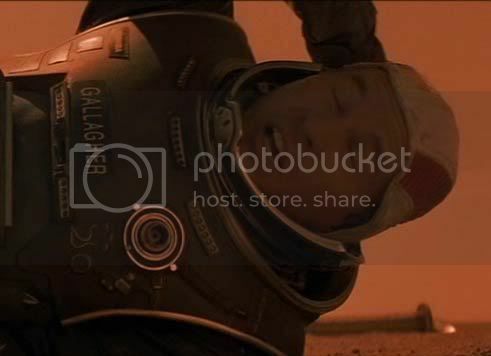 In this pivotal scene from the concurrent Red Planet, Val Kilmer's character removes his helmet and discovers he can breathe the air of Mars. 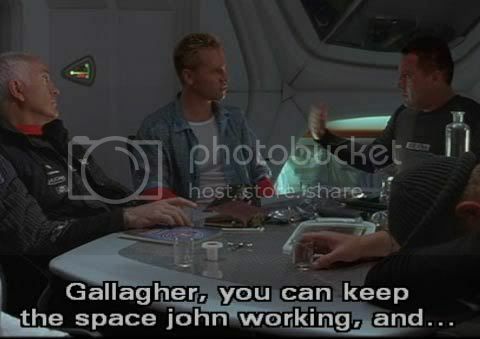 Here Kilmer's character is tagged with the mantle of the Martian Baptist. Of course, his role will develop along the eternal lines later in the film. Here's a foreshadowing of that metamorphosis, when - completely appropos of nothing - Terrence Stamp's character creates the Masonic point in the circle icon as he dies. The point in the circle was associated with the Baptist, but with the Sun in earlier traditions. 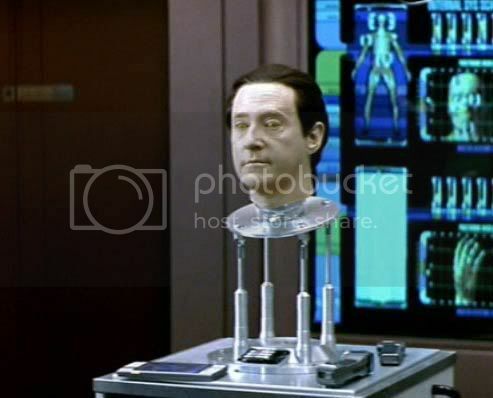 In James Cameron and Steven Soderbergh's Solaris, we see Chris Kelvin remove his helmet when he decides to abandon his mission and become one with Solaris. There's that seal again. In Star Trek: Nemesis, the Johannine symbolism seems clearer than ever before. 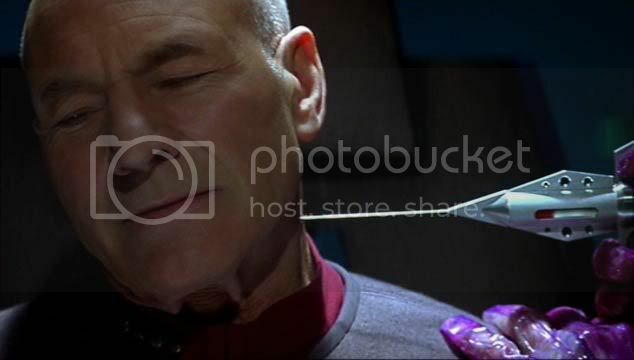 Here Jean Luc ("John the Light") Picard is kidnapped by the Romulan warlord he is literally the genetic forerunner to. Notice the red collar creating the impression of a severed neck. Here is the official synopsis for those of you who haven't seen the film. Later on, Admiral Janeway orders Picard on a mission to Romulus. The new Praetor, a Reman named Shinzon, has requested a Federation envoy. On the way to Romulus, Data briefs the crew on the Remans, noting that due to high temperatures on one side of their home planet, they live on the dark side and avoid the sun. It is also noted that the Remans have a reputation as warriors — during the Dominion war, some of their troops were used as cannon fodder. Once they arrive at the designated coordinates, the crew of the Enterprise is kept waiting for 17 hours. 17 hours. And of course, for our purposes Janeway essentially means "John's Way." Here Data has his turn, as his forerunner B-4 is found on an alien planet. Importantly, the crew of the Enterprise (NCC- 1701) takes the shuttle Argo to find B-4. Argo is one of the names for Osiris. Incidentally, the DVD of Nemesis includes 17 minutes of footage not seen in the theatrical version. This is from the television production of Dune. Duke Leto Atreides skull is worshipped by the Fremen, just exactly as their real-life forerunners worshipped the head of the Baptist. 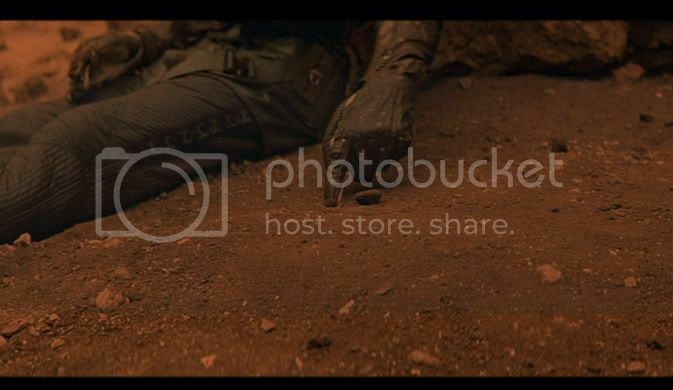 The Fremen's revenge on the House of Harkonnen for Leto's death couldn't possibly be clearer in its symbolism. 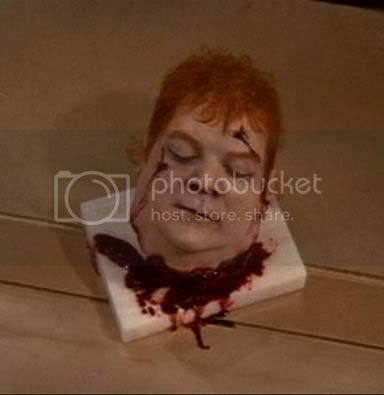 This still comes from the Lynch version of Frank Herbert's legendary Templar parable. But what of Salome? Well, this Scarlet Woman in this scene from Terminator 3: Rise of the Machines certainly seems to fit the bill. One of the functions of ritual drama seems to be to magically reverse an unhappy historical outcome. In Dagon, a brilliant parable of competing Piscean gods, the Salome character comes and intervenes while the hero is about to undergo a variation on the Baptist's death. This character is named Josepho and sees himself as the messenger of God. 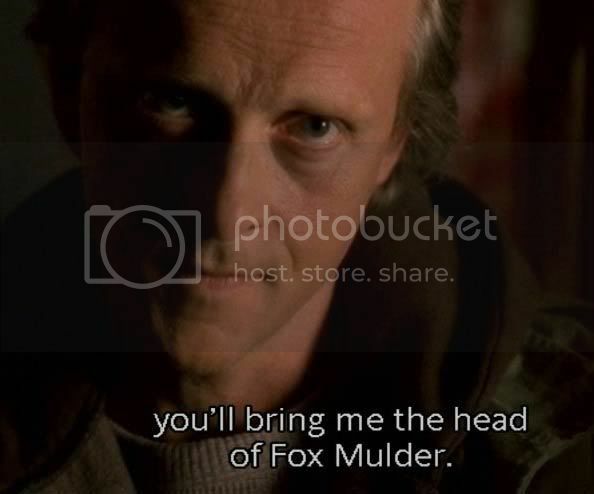 He kidnaps Mulder and Scully's son William in order to control the events of the coming alien invasion on December 23, 2012. He essentially wants to raise their alien/divine child as his own son. I'll leave it to you guys to puzzle out the metaphor at work there.